DID YOU SEE THAT? : Game Show Pitch with Former Talk Show Host! Burbank, CA -Producers and crew gathered last Wednesday morning at “Center Staging” studios located in Burbank, CA to film a new game show concept presentation that tests contestants memory and attention to detail in movie visuals called “Did You See That?” An audience group of roughly around twenty-two people were brought-in that afternoon to help create a real game show ambiance. The stage consisted of a small room with hard wood floors surrounded by black duvateen curtains. A small pair of bleachers was set-up on one end of the stage for audience seating, and four plasma televisions on the other end displaying the game show title art, “Did You See That?” along with a money ladder. Screens also displayed the intermittent film scenes that contestants were to later recall specific details. From daytime, to game show host, Montel Williams. The host of the show, was surprisingly, former daytime talk show host, Montel Williams of “The Montel Williams Show” (1991-2008). Yikes! Not exactly game show material. But, I still gave him the benefit-of-the doubt, as I do with every host. However, my conclusion at the end of the day was – NOT a good game show host. I must give him props for not using a teleprompter. However, he certainly needed one. He had trouble following the show, and even made a negative remark at the end of one of the fake contestant’s game! Because Williams has the bald head thing going-on, he seemed to try to channel Howie Mandel from “Deal or No Deal”, instead of realizing his own version of how to be a game show host. This game show pitch presentation was filmed to be sent-out to multiple network executives in hopes of gaining some kind of interest to produce a real version of the show. Producers would not mention specifically which networks it has on its horizon. It appears to be a half-hour show. Contestants must remember details from a movie scene accurately from four multiple choice answers. Two films that were in play were “Mamma Mia!”, and “Good Fellas”. Contestants are asked, for example, of “Mamma Mia” scene where Meryl Streep is singing the title song, “What was the color of Pierce Bronson pants?” Contestant must choose from a list of: Red, Blue, Black, or White (answer: blue). Another example from the famous back kitchen entrance scene from “Good Fellas”, “What type of bird was at the bottom of the stair case painting? – Tucan, Parrot, Owl, or Eagle (answer: Tucan). 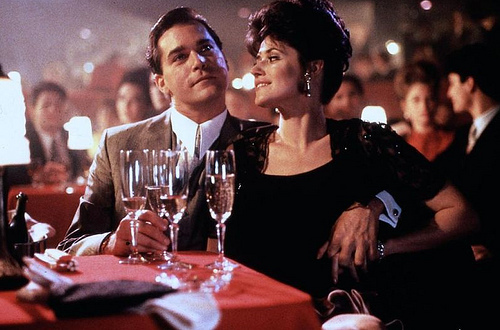 One movie scene chosen from Marin Scorsese’s “Goodfellas”. It was quite impressive how technically well this presentation was set-up. No technical flaws leading to hold-ups at all! The only few hold-ups came from Williams. The final game consisted not of a movie scene, but of real-life video shot of a producer with the contestant at a local Los Angeles Farmers Market. This is a concept show producers stated they wanted to introduce to networks in that there are alternatives to playing the game other than using film scenes. My suggestion to this is – why not just make it a holographic internet game? My complaint, there was a big visible advantage this last contestant had over the other two who had to rely on memory from watching a film scene. That advantage is that this contestant ALSO had real-life memory to got back to, to recall certain visuals seen on the screen. NOT FAIR! Contestants are seated on the stage with a table of six different buzzers next to them, each representing a different TV function: the “Bank” button lets the contestant to bank the money that they have earned so far, thus, if missing an answer afterward, they still walk-away with the banked amount;’ the “Stop” button allows the contestant to stop the game and leave with the money that they’ve banked; “Pause” button allows the contestant to seek-out the help of a friend for an answer; “Fast-Forward” button lets the contestant skip a question, but in turn, also skips the money amount of $50,000 which leaves them with a maximum allotted total of $50,000. Host, Williams warns each contestant very heavily before hitting the “fast-forward” button. In one case, he even made a contestant feel bad about taking this option at the end of her game, stating: “think, if you had not used that fast forward button, you would have had that other $50,000”. A producer of the show pointed this out and asked him to re-do the take without making that statement. In any case, if this show is picked-up with Williams as the host, we at HOLLYWOOD JUNKET, send all of our game show mojo his way, and hope he finds his inner game show self! Awesome,I adore Mr.Jackson! He was the most talented to ever do it! We will never have someone like MJ! RIP to the GREATEST!